The full moon is coming up soon (July the 3rd this year) and I figure I should write a little blurb on it because I feel like it...That's kinda what I do right? Well I know this moon by 3 names Blessed or Blessing moon, The buck or antler moon, and the thunder moon. I have no clue behind the story on the Blessed moon so I'll leave t at that but I do know about the other names. 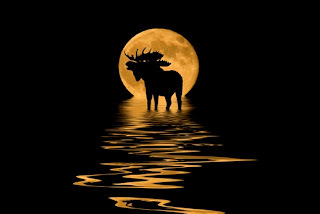 The Buck moon also refereed to as the antler moon has those names for the same reason. Many animals donning antlers either start growing or do the majority of their antler growth during this month. The bucks are maturing and growing their antlers. Switch the year around obviously for south of the border...add 6 months and that gives you a Buck moon in Janurary I think. But I'm north of the border, FAR north so this is my buck moon. The story behind the Thunder moon is quite self explanatory, this month is more likely than any other month to have thunder storms, end of story...actually I heard thunder this morning, nothing now though only gentile rain.